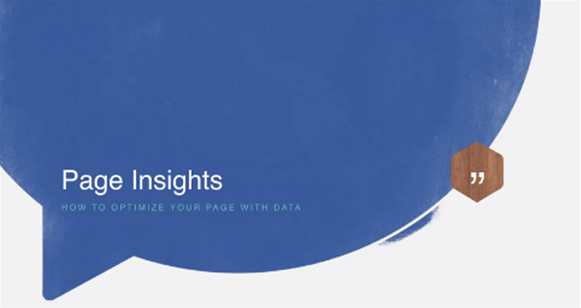 This data can be accessed from the “Insights” tab right at the topmost of your Business Profile Page. Reach – Is the number of unique impressions that have been serving aka the number of unique people that have seen your post/content. 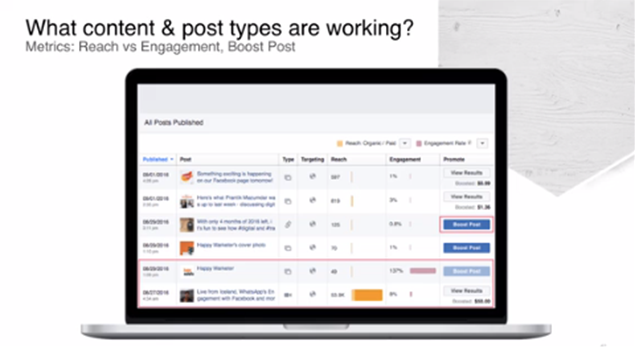 The Insights tab provides you with the reach broken down for each different type of post format. This insight ensures that you know what sort of Audience: Demographics, Age, Location, Language etc. are currently liking your page and can engage with them better. This is one of the most important insights that Facebook provides us with. These metrics can be found in the “People” section of “Insights” tab. This is one more important parameter for a business since you can post your content or host your Facebook Live during this specific time that the most audience is online so you can reach out to most people who are actively seeking for content on your page. 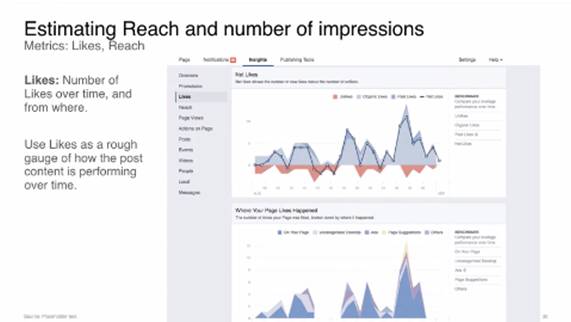 One of the best ways to promote your business/brand on Facebook is to specifically call out actions and to understand what actions are more meaningful to your audience. These could be “Call Now” with your phone number enlisted, “Get Directions” with the physical address of your store on the google map enlisted, “Visit Website” etc. 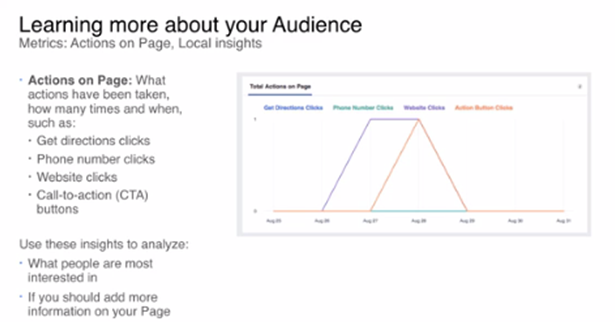 Understanding which of these actions your audience is taking on your page you can boost that specific action to reach more audience and target them appropriately. Since we can use a lot of different formats like Text posts, Videos, Slideshow, Carousel and Canvas which we have understood on our blog facebook business page it’s imperative to understand which content type our audience likes the best so we can invest more of our time and energy in creating only those types of contents. 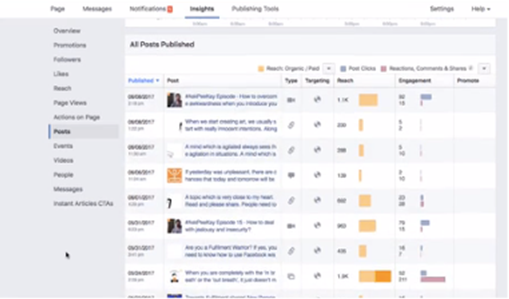 Facebook allows you a sneak peek into what your audience likes on your page so you can work towards creating more of the post types. 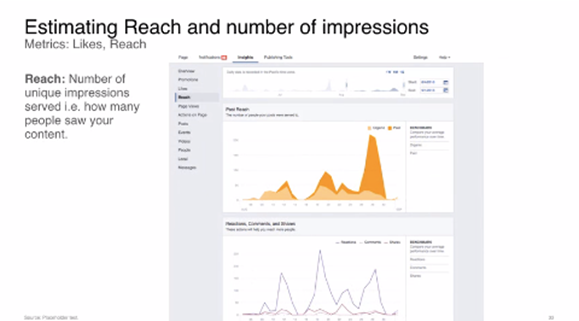 This data can be found in “Posts” section of “Insights” on your page. 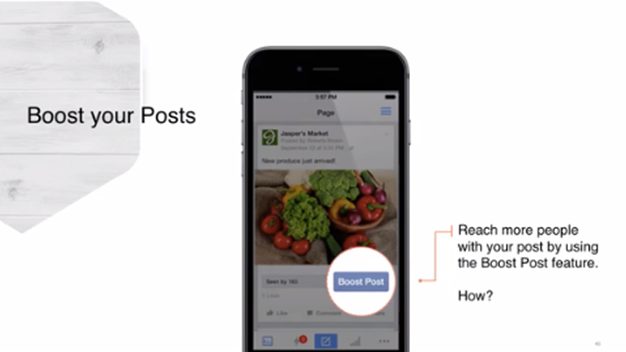 Now that we have come to an end of the “Insights” section that Facebook provides us lets took at a paid promotion feature called “Boost Post”. 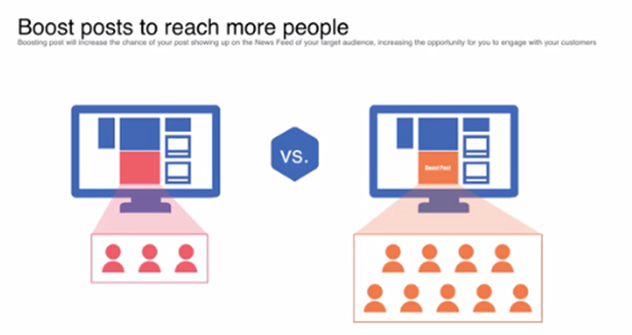 This ensures that your post reaches more audience who are spread across the Facebook platform and may not be your page fans or people who are engaging with your business profile page yet. Under every post that you post on your business profile page you get a small button below the post called “Boost Post”. Lets look at Organic post v/s Boost post. Organic post – Organic post only reaches people who are your fans and who have liked your page. Since the people liking our page is limited the reach of an organic post is very limited. It is the same audience that have already liked us and thus we are not reaching any new audience who are out there on the Facebook platform. 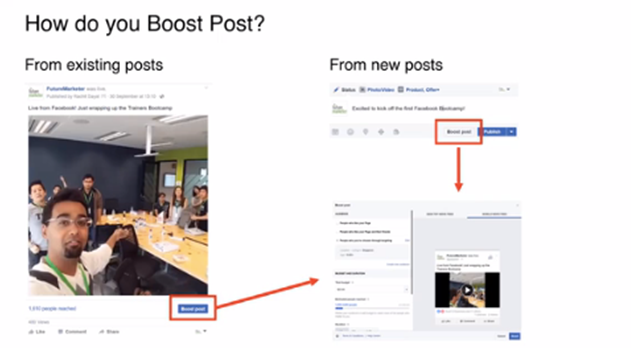 Boost post – Boost post is a paid feature more like a promotion that you run on your Business profile page which ensures that your post reaches people who are more likely to like your page or engage with your brand. Boost post engages new audience rather than the ones that are already present on your page so your brand awareness can be increased. 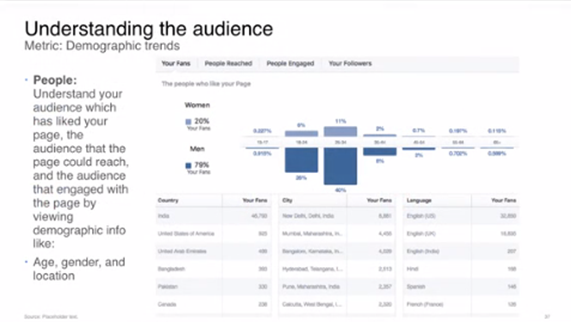 Facebook also lets you specifically target to certain audience dependent on Demographics, Location , Age, Interests etc. so you can define the ideal audience for your brand/business. Now that we understand the “Why”, lets understand the “How”. As mentioned above under each post that you post on your business profile page you will find a small button called “Boost Post” which when clicked on opens a new tab with targeting options that you can choose for the ideal audience for your page like : Demographics, Age, Location, Interests. 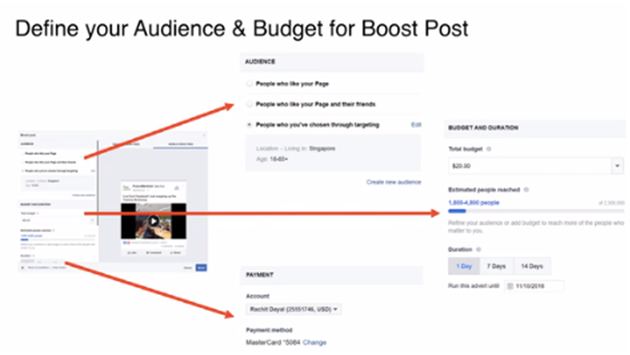 You can also select a budget that you can allocate for this boosted post and dependent on your impressions the ad will run until you have exhausted the budget that is being allocated for this Boost post ad. If you thought it was that easy to boost your posts you are wrong, once you click on Boost post, Facebook reviews your post and either consents to the ad or disagrees. Sometimes this happens as a mistake as some posts might be considered as “Inappropriate”, if you think your ad does not fall into that category you can appeal to Facebook to approve it and they might consider it. This whole process takes around 2 – 3 hrs depending on if you are using a new ad account or if you have been using the paid promotions for a while now. To get a customized Facebook Marketing strategy for your brand reach out to me on sirisha@brandingbypixels.com . Stay Tuned and have a great week ahead.